A unique source: the most eminent personalities and the best experts draw up and review the European Union and its policies - governance, federalism, financial regulation, budget, globalisation, social model, etc. A practical tool: more than 35 unique maps, a summary of political and legal Europe, a complete set of commented statistics on Europe. This 4th edition includes an exclusive interview with José-Manuel Barroso, President of the European Commission, and articles by A. Lamassoure, J. Ackermann, S. Serfaty, M. Lemoine, P. Perrineau, and other experts including some of the best experts of European issues. 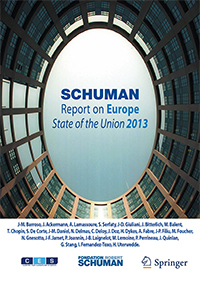 All of the 27 articles in the Schuman Report on Europe, the State of the Union 2013 all convey the same message: will 2013 be the year of recovery? This book which was edited by Thierry Chopin and Michel Foucher, was published by Springer Verlag.